Blame Cox. Just a little. I’ve been reading a lot of AJC Braves blogger David O’Brien lately. 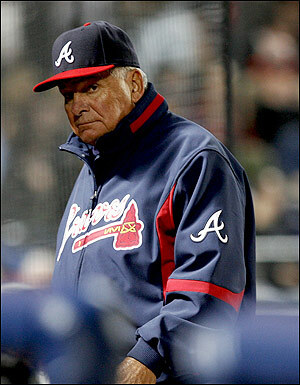 Today he interviews Braves reliever Will Ohman and he asks him if manager Bobby Cox should be blamed for the Braves struggles this season. “I think that blame is placed at the feet of the manager far too many times. He’s writing out the lineup card, but we’re the ones playing the game. It’s not often that players throw their manager under the bus, and few managers are more beloved than Cox. So Ohman’s response isn’t too surprising. Consider this stat: With the bases loaded, the Braves are third in the NL with a .282 average (29-for-103) and fourth in OBP (.307). But Francoeur is 3-for-22, twice as many at-bats with bases loaded as any other Braves player. Without his numbers, the rest of the team’s average with bases loaded is .321. The NL leader, by the way, is the Dodgers at .308. The Braves’ individual leaders are Chipper at .750 (3-for-4, one walk), Tex at .500 (5-for-10), Kelly at .500 (2-for-4) and McCann at .455 (5-for-11). Chipper has 17 fewer at-bats with bases loaded than Francoeur does, and that Tex and Mac combined have one fewer bases-loaded at-bat than Francoeur. Yes, continuing to bat him fifth or sixth has been a costly mistake. Hey Dave, don’t forget that with runners in scoring position, Francoeur is hitting .193. Ugh. The Braves’ biggest problem this year has been an inability to win close games. This, despite the fact that the Braves pitching staff has been the best in the league. If Cox hadn’t insisted on batting Francoeur fifth or sixth all year, how many more runs would the Braves have scored? And how many victories in one-run games would that have translated into? sounds a lot like J.D. Drew’s pattern. the guy will go on these long slumps and then break out of them with a grand slam. and there’s really no in-between. Well, remember Lyndsay, he also draws walks. And yes, I know those have value. But my GOD MAN! Swing at it!!!!! so you’ve got Eric Gagne…and JD Drew on your fantasy team. do you also have Julio Lugo? because then you’d really complete the Sox suckage trifecta from last year. I know…I know. I don’t know how I ended up with both of them. Irony is a cruel mistress. At least I also have Jacoby! Nick, that book was my favorite around like third grade. I went through a big Matt Christopher bender. “Ice Magic”, “Miracle at the Plate”, etc. Oh man. For me it was Nancy Drew—all Nancy, all the time. No baseball connection whatsoever, except that for a brief while I was so addicted I even insisted on bringing the books with me to Fenway. Well as long as you are admitting that you liked Nancy Drew, I will cop to liking the Hardy Boys. They always made detective-izing look so easy! Apparently deduction is not necessary, because all you have to do is convince the villain to tell you his evil plan right before he kills you, and then escape at the last second! It helps if you have Titian blonde hair, a yellow convertible, and a friend who knows judo. Sarah, what I can only presume are Nancy Drew references are entirely lost on me. For the record, Francoeur has seen some time in the 7 spot. But you’re exactly right, he has gotten far too much PT and is hitting too high in the lineup. It’s hurting McCann, who usually hits 5th, to have his buddy Frenchy behind him. McCann is known for having a good eye, but this year he already has 39 walks, just two shy of his career high. A guy hitting .300 needs some better protection than Francoeur. It’s a pretty small sample, but since I went to the trouble of compiling it, I’m gonna mention it. Tidbits from the five games that the Braves have played when Francoeur wasn’t in the lineup: The Braves have gone 3-2 over that span, scoring 20 runs. The replacement rightfielders (Gregor Blanco in the second game of a doubleheader against the Mets and Jason Perry for the four games that Francoeur was sent down to AA) have gone 2 for 20 and left nine men on base. Seven of those runners left on were by Jason Perry in the 17 inning victory against the Astros. No walks, four strikeouts, no runs scored, and one RBI. So the production has been paltry in right no matter who’s been there. I’ll be the party pooper. I really think that batting orders are not nearly as important as we think. I tried out Baseball Musings’ lineup analysis for some numbers. With Francoeur batting sixth, the Braves project to score 4.879 runs per game. If he had been put into the #8 spot all year, they would have scored 4.885 runs per game. So that’s a difference of .006 runs per game. Less than a run over 162 games. Take it for what you will. Well, I’m not sure quite how BM (really? that’s an unfortunate acronym) calculates those things, but I know that JD Drew hitting in front of Manny Ramirez has been much more productive than JD Drew hitting in front of Jason Varitek this year. People in Boston are all talking about how Drew has “emerged” as a productive hitter, and how he’s “stepped up” with Papi injured. But really, I think he’s just benefiting from having a guy with a .312 career average behind him, rather than the guy who is hitting .219 this year. Sarah, the program takes into account OBP and SLG for each player (and nothing else) and then projects, based on those two stats, how many runs are expected to be produced. It then tries out every possible lineup combination and spits out the best and worst lineups possible. Of course, it’s not perfect. There’s a lot of stuff that doesn’t get taken into account. But it’s a good, clean indicator that levels the playing field. What if Francoeur had been in triple-A, where he probably belongs? How many runs would the Braves have scored with a different outfielder? I’ve gotta believe that if Atlanta took Frenchy’s .198 average with runners in scoring position and replaced it with somebody who hit even .250 with RISP, that would make a big difference. Using, say, Greg Norton in place of Francoeur gets you 4.934 runs per game. Roughly speaking, that’s about nine runs more per 162 games. And to answer the “.250 with RISP” part, with the same number of ABs, a .250 hitter would have hit 27 hits – 6 more than Francoeur hit in those situations. But that doesn’t necessarily mean that you should just go and tack on 8 or 9 runs to the Braves offense in this theoretical scenario. In order to do that, you’d have to take into account how those batting behind him performed following his ABs too. Just because Francoeur didn’t drive them in, doesn’t meant that no one did. And with RISP with 2 outs, he did hit .250.